From "Reinveting the Wheel of Democracy: An Exercise in Intercivilizational Exchange" by Dr. Ahmad Sadri. 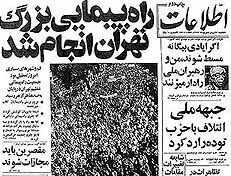 This essay, summerized for The Iranian, was first delivered at a conference titled "Under Siege: Islam and Democracy" organized by Columbia University's Middle East Institute in June 1993 and published the following year in a collection along with articles from other speakers. The import of this essay is somewhat counter-intuitive. I will argue that if new local interpretations of Western secularism and liberal democracy are to emerge in Islamic civilization (and I both believe and hope that they will), such developments will come about not despite the spread of the much dreaded "Islamic fundamentalism" but exactly because of and through it. This contention is not based on underlining (in the familiar fashion of Muslim liberals) affinities between Islam and democracy. The existence of such institutions as shura (consultation), Ijma' (consensus), and ijtihad (axiomatic legal reasoning that could be the source of political innovation) have long been cited by liberal Islamic thinkers to argue that Islam is democratic in nature. My argument is based rather on a new discourse in Islamic thought analogous to the early currents of Western secular political tradition. This mode of reasoning, which I term "post-revivalist Islam" attempts to demarcate and theologically justify the separation of religion as intended by God from its interpretations and applications to the mundane aspects of human life. Although one must not expect to find democracy outlined in theory, fully and passionately believed in, or consciously practiced everywhere in the West, there is no doubt that it is out there, at the root of political institutions, ingrained in political culture, and perpetuated in social mores. To be sure, democracy as a political culture, and a way of organizing political life is a modern Western innovation. It creatively combines new ideas with an eclectic mix of its Greek and Roman cultural heritage. The synthesis slowly emerged in the favorable social, economic, and political conditions of late medieval and early modern Europe and was formally enthroned only in the late eighteenth century in the United States and then in Europe. The political and economic stability associated with it, and the success of liberal democracies in offering a guaranteed modicum of privacy and rights to individuals, even to minorities, as well as their stemming of the tide of political corruption, offers an optimum answer to the problems of managing modern societies. Such alternative Western theories of self-government as socialism have failed to realize their own lofty promises or to deliver anything comparable to the admittedly modest accomplishments of liberal democracy. Liberal democracy, in short, is one of the triumphs of human ingenuity, a cultural commodity clearly in demand. The question is whether it can take in any civilizational soil. Can, for instance, Islamic civilization suppress its appetite for founding divine republics in favor of democracy? Here we need the benefit of intercivilizational comparisons. The Western civilizational cluster contains two sources for anti-democratic temptations. The first is the Greek fascination with utopian republics of virtue, which tends to castigate the democratic alternative as the dictatorship of base desires, and of the poor and uncultivated. Modern democratic synthesizers had to wake first from this sweet dream and settle for more practical aims before they could contemplate the contours of a modern political system. The second anti-democratic temptation is the lure of a government of God, the common Abrahamic legacy of the West. The worship of a single personal God that also functions as the lawgiver seems to inspire a strong hope of establishing a divine government, even at the expense of explaining away or twisting the letter of chiliastic expectation. The Christian West has already trodden this windy road, crowning crusader kings and Christian pontiffs and founding an occasional "fundamentalist" republic (Calvin's Geneva). Islamic civilization is currently in the turbulent process of reinventing its political institutions. Liberal Muslim intellectuals have for a long time tried to ground democracy in the text of the Quran and the context of the practice of the Prophet and the Caliphs, or political progeny. Western observers have made much of the waning of the Islamic liberals' fortunes in the face of the rise of revivalist or "fundamentalist" Islam. This has been cited as evidence that Islam by its very nature is anti-democratic. This claim is absurd. For one thing, Islam is in no way less democratic or more averse to human rights than either Christianity or Judaism. For another, the fundamentalist Islamic ideologies are no more authentic or less Western than their liberal rivals. Both are influenced by external (economic, political, etc.) conditions, and both have heavily borrowed from the West. In militating against democracy in favor of a republic or virtue, Islamic fundamentalism follows a long anti-democratic Western tradition, expressed all the way from Thraymachus' challenge to Socrates to Marx's disdain for "bourgeois democracy." The anti-democratic stance of the recent Islamic revivalist movement in Iran was less influenced by Islamic jurisprudence than by French chic Marxist rhetoric against the pettiness of an unheroic docile democracy (as evidenced in the writings of Dr. Ali Shariati). The elites that took over the reins of power in Iran conceived of themselves more as enlightened despots than as Shi'ite vicegerents of the occulted Imam. Western observers have been quick to point out that in internal theoretical civil wars, Islamic liberalism has borrowed from the main currents of Western liberal theory. but so have the Islamic revivalists who dipped into Western counter currents of populism, anarchism, Jacobinism, and Marxism. In the wake of the triumph of the Islamic revivalists in Iran, and at the outset of Islam's fifteenth century, the stage is set for the emergence of a post-revivalist synthesis riding on disenchantment with seventeen years of revolutionary rule. If the actual establishment of, and disenchantment with, the "City of God" is the key that opens the gates of the secular city, then Islamic civilization is on the verge of a decisive breakthrough. This is, indeed, a familiar civilizational crossroads, a moment of déja vu in the larger civilizational cluster of the West. Democracy was not an objective possibility for Islamic civilization as long as the spell of Oriental despotism remained unbroken. Muslims in Pakistan and especially in Iran are experimenting with their own versions of the European autocephalous cities where democratic rule first took root. Only now is Islamic civilization poised to reinvent the wheel of democracy. Once a suitable outline of the most relevant aspects of liberal democracy is recovered from the Western history of ideas, social praxis, and institutional settings, the difficult task of adapting it to Islamic contexts must be tackled in theory and practice. Of course, problems are easier solved in theory than in practice. In the following I will attempt to tackle the easier task of overcoming some of the theoretical barriers that block the democratic hopes for Islamic civilization. The political thought of the West from Plato to Hegel and Rousseau has (correctly) observed that some political cultures are more friendly to democracy than others. Those who happen to belong to the cultures consigned to an anti-democratic fate must learn to heed this problem without indulging it. Political cultures are not graven in stone; they change. Just as democratic political culture can give birth to a quite undemocratic one (reading the history of this century who can doubt this? ), why not assume that the reverse might also be brought about? The history of the West provides ample evidence that just as people can unlearn democratic habits, given a will and the serendipity of the right conditions, so can they collectively learn to foster a democratic political culture. Source of authority: God or people? Here Islamic civilization faces a serious problem, but one that is not unique. I have already pointed out that all Western civilizations share the temptation of establishing the city virtue on earth. Can Islamic civilization advance beyond this specter? In what remains of this essay I will discuss two elective affinities between the Shi'ite interpretation of Islam that prevails in Iran and a secular, democratic system. One of the main preoccupations of Greek (and, by transmission, of Islamic) political philosophy is the creation of a republic based on individual virtue. If this is the goal, then democracy cannot possibly be an ideal form of government. As Leo Strauss has observed, what made modern democracy possible was the moderns' giving up this ideal for a "lowering expectations" and acceptance of the weakness and corruptibility of man. A modern democracy differs from a utopian model insofar as it distrusts and thus divides the ruling elites against themselves. A modern democracy demands a lowest common denominator of efficiency from its leaders; not trusting anyone with absolute power, it sets up a system of checks and balances to control the deviations of its elites. These modern assumptions which oppose the Platonic plans of all pre-modern "Western" philosophers (including such Islamic political thinkers as al-Farabi) resemble the descriptions of man in the Quran as a frail, impetuous, covetous, and miserly creature. This is the rule; virtue is the exception. It has been consistently emphasized by modern Western philosophers that if man were an angel, he would need no government. On the basis of the non-angelic Quranic view of man, it is possible to envision a modern Islamic secular system of self-government based on the lowest common denominator rather than the highest expectations of human nature. But what about the revivalist Islamic interpretations that maintain that God intends to override the weakness and wickedness of man by creating a virtuous society through divine intervention? This question can be answered only in the context of Islamic and, in the case of Iran, Shi'ite sacred history. Islam does not sanction an institutional intermediary between man and God. Shi'ite Islam emphasized the importance of the divine infallibility of the leaders of the Islamic community. Even with the best of intentions, a pious leader remains open to both intentional and unintentional misreading of the divine will. This may explain why, before the rise of the new orthodoxy in Iran, Shi'ite interpretations of the political implications of Islam led in the direction of quietism. They condoned, ignored, or opposed the secular authorities and quietly awaited the end of time which was to be ushered in by the coming of the Lord of Time, the last of the Imams. This quietist attitude is no longer tenable in the wake of new influential heterodox reinterpretations which have quite ingeniously, almost by slights of the theological hand, circumvented the theological obstacles and paved the way for an actual Islamic state in the absence of the infallible Imam. The emerging post-revivalist thinkers have in turn started by delineating the boundaries between the spheres of God's intentions and man's interpretations of those intentions. But a historical perspective is still lacking. The revivalists established that although an Islamic state had never been deemed incumbent upon believers in the time of the occultation of the infallible Imam, this did not mean that no kind of Shi'ite state should be attempted. The post-revivalists can argue that the decision of the believers to govern themselves need not imply the presumption of the ruling in the name of or on behalf of God. In this argument the traditional legal interpretation as well as popular chliastic expectations are fully on their side. Salvation from the new orthodoxy lies in reinventing Shi'ite orthodoxy; secularism is quietism with teeth. As the period of occultation of the infallible Imam is the era of the eclipse of divinity, these are indeed secular times for Shi'ites. Western secularism and liberal democracy made the best of exactly this situation. The writing is on the wall. The author is associate professor sociology and anthropology at Lake Forest College. His book, Max Weber's Sociology of Intellectuals was published by Oxford University Press in 1992, 1994. He is currently doing research on the role of Iranian intellectuals in defining the political culture of Iran.